10th Year Commemorative Book – Emirates Airline Festival of Literature. 84 inspirational voices. 10 years of the Emirates Airline Festival of Literature. 1 stunning book. Words are an integral part of being human – we read them, say them, spell them, sign them, make sentences with them and tell stories with them. Words are the start of everything. 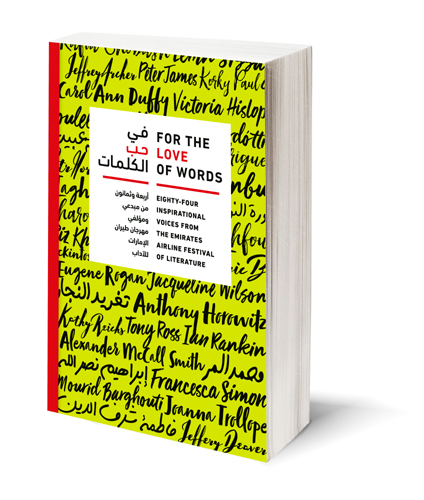 For the Love of Words features eighty-four inspirational voices from ten years of the Emirates Airline Festival of Literature, from Jacqueline Wilson and Fatima Sharafeddine to Alexander McCall Smith, Kathy Reichs and Anthony Horowitz; Ibrahim Nasrallah and Jeffrey Archer to Victoria Hislop, Mohammed Al Murr, Shashi Tharoor, Peter James, Kate Adie and many more. This anthology is a collection of articles, poems, short stories and illustrations from these contributors that celebrates their love of words, how words fuel their imagination, and how they in turn use words to fuel the imagination of millions. For the Love of Words is available at the Festival venue, InterContinental, Dubai Festival City and in bookstores across the UAE.